Even if you aren't a technical analyst, you can become more confident as an investor if you study charts. The greenhorn investor might look at the market trends and numbers but miss a clear sign right in front of him in a chart pattern. The problem for beginners is that there are hundreds of patterns and formulas and signs that can be put to use, but there's no real way of knowing if you'll ever be able to use what you learned. It is entirely possible that you could follow securities that behave like nothing you've ever observed. Fortunately, the concepts are very easy to grasp, and they mostly have simple names that anyone could remember. Learning these terms and patterns requires little intellectual investment, and their potential usefulness is great. Something named “death cross” must be a heavy-duty indicator, right? Don't let it scare you; it's just another tool in your investing toolbox. The death cross is one type of moving average crossover found in a chart's Bollinger Bands. It's the opposite of the golden cross. The death cross happens when a security's long-term simple moving average (SMA) goes above its short-term SMA, crossing the lines and signifying that it's becoming bearish. It's a guaranteed sell sign. The reason it's a “death” sign is simple: A security's short-term average dictates the direction the long-term average will take in the future. When the short-term average shoots upward, the long-term will soon follow. Likewise, if the short-term drops steeply enough, the long-term will eventually drop too. The cross is the point where this movement becomes inevitable. Don't let the name throw you off. A stochastic system is any system capable of random actions. It's the opposite of a deterministic system, which always gives the same result as long as the starting conditions are the same. In a stochastic system, you could run two tests with identical starting conditions and get two different outputs. It's the type of system that requires us to use probabilistic models to predict outcomes. The financial markets are this type of system. Oscillators, generally speaking, are chart indicators that rely on upper and lower thresholds. When the attribute they measure crosses one of the boundaries, it signifies something. The model looks at closing prices and assumes that they're probably going to move in the same direction as an overall trend. If a security closes at the high end of its trading range, there is a general upward trend, and so forth. The concept is pretty simple. If there were a perfect description for a chart pattern, this would be it. When a security is in a prolonged decline, there might be short upward rebounds as it trends downward. They might look like they're the beginning of a recovery, but they quickly level off and then continue the downward motion. The end result can be a series of humps moving down the line like a ball — or in this case, a dead cat — bouncing down a flight of stairs. 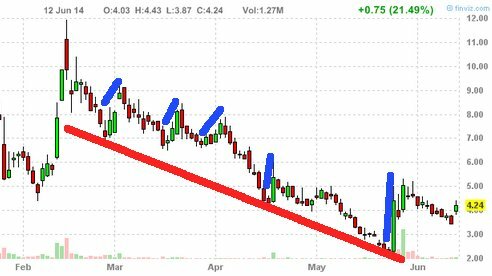 The chart above shows a stock heading for a dead cat bounce. The blue lines mark the series of upward bounces during an overall downward trend. Though the last month has slowed its fall, it's still showing loss. The Relative Strength Index, or RSI, is one of the most commonly used momentum indicators. It was developed in the late 1970s by engineer and technical analyst J. Welles Wilder and was first published in his book New Concepts In Technical Trading Systems in 1978. It improves somewhat on the stochastic oscillator because it's a much simpler formula. Its purpose is mainly to show whether a security is overbought or oversold. Like other oscillators, RSI works on a 0-100 scale. Numbers below 30 indicate oversold, and numbers above 70 indicate overbought. When a security is in this territory, it's nearing a reversal. The typical RSI measurement uses the opening and closing data from 14 trading days, but it can be extended to longer ranges for a more granular look at present conditions. The candlestick is a vertical line used to visualize price movement. Though it can be used in many different settings, it usually tracks four qualities of a security in a single day: its open price, its high, its low, and its close price. Candlesticks are plotted on a Cartesian plane and are used to indicate bullish and bearish trends. 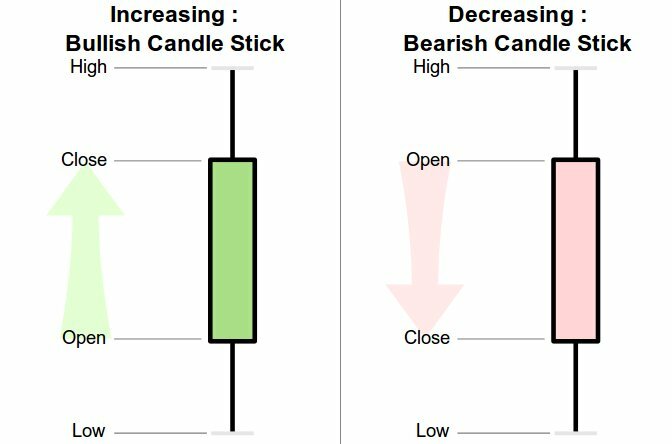 Because candlesticks are a convenient visual representation of price activity, they can be used as alerts for anomalies in a security or as a more detailed view of market interest. Recognizing patterns in candlesticks is a whole study of its own. Pennants are flat triangular patterns on a chart where the trendlines gradually come together. As one might expect from the name, they look like the pennant flags that used to be so popular among sports fans. Over the course of one to three weeks, the support trendline rises to meet the declining resistance trendline. Along with the flag, wedge, and cup and handle, the pennant is a continuation pattern. Continuation patterns are a temporary lapse in a larger trend, and they usually occur after a big change in price. 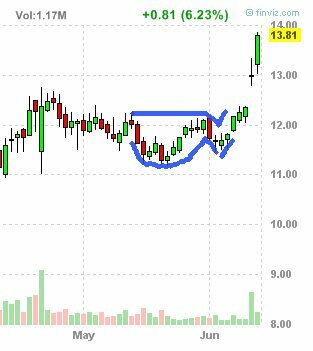 A cup and handle is drawn on a chart when a security stops an upward climb, takes a large, u-shaped dip, and then takes another small dip before returning to its upward trend. It is a bullish continuation pattern. The “cup” is defined by a big jump, then a decline of about one-third to two-thirds of the first jump, then a less severe decline, then a return back — a sharp jump back up to the starting height. The “handle” is another downward move after the security has risen back to the point before the cup. 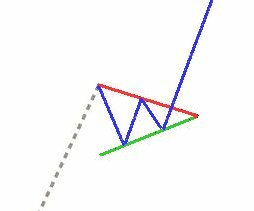 This decline is traditionally one third of the size of the “cup” and forms its own descending trendline. As soon as the price hits above this trendline or meets the peak of the cup, it is a signal that the upward trend is resuming. The example shown to the right is less than ideal because it took place over a very short period of time, but as you can see, the signals proved to be correct.